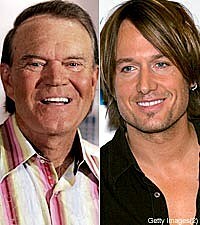 Countless country artists today name Glen Campbell as one of their musical heroes. But there's one in particular with whom the admiration is mutual. When The Boot asked the legendary singer if there are any younger artists whom he sees as a kindred spirit, Campbell mentioned an old friend he's known for more than 30 years. "Keith Urban -- what a talent," Campbell told us at his recent AOL Music Sessions taping. "When I first met him, he came to my concert in Australia. He was about 8 years old, and he said, 'Mr. Campbell, when I grow up I'm gonna play guitar and sing.' And look at him! He's a great songwriter, he's the best guitar player in the world probably, and he's married to one of the most beautiful women in the world ... and they just had a kid, that's fabulous! The 72-year-old Campbell will release a new album, 'Meet Glen Campbell,' on August 19. It includes an eclectic mix of ten cover songs from artists ranging from Green Day to John Lennon. Campbell performed several of the album's tracks in our Sessions studio, plus his classic tunes 'Wichita Lineman' and 'Rhinestone Cowboy.' Come back to The Boot on August 19 to watch the full performance.